In Built to Last, Collins and Porras seek to describe the habits of successful companies. They propose that successful companies are not afraid to continually transform themselves into something better- but they remain true to their core values. This idea can be applied to individuals as well. 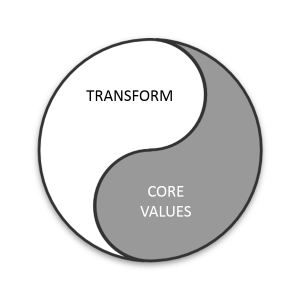 The figure representing this idea uses the Yin (stable) Yang (changing) symbol. It is also a reminder of the concept of impermanence- all things eventually change. The upper loop drive actions to close the gap to a desired vision, leading to a transformation. The lower loop creates values from beliefs formed by assessment of experiences and how well needs are met. Since it takes time to build up experiences (and values), the lower loop changes slower than the upper loop- supporting the view of a stable set of core values that might be modified over the long term. When our experiences shows us that our needs are being properly met, our beliefs and values are working for us and there is little need to change them. This is the idea of Core Values from Collins and Porras. We should then seek to transform ourselves to reach our vision.